©Healy Racing Photos Everyone knows the state of the going is fundamental to any race. And since demands differ, providing perfect conditions for everyone is impossible. But the question of what should constitute an acceptable surface, particularly on welfare grounds, is once again under the spotlight. The Scottish Grand National at Ayr on Saturday took place on ground officially changed to 'good, good to firm in places' after the big race. Before it five of the runners were taken out. They included two of the major contenders, Beware The Bear and Dingo Dollar. In all 13 horses were non-runners on the card owing to ground conditions. There will always be different interpretations of what is acceptably quick ground. Usually they involve subjective judgements about what constitutes jar, judgements often linked to either the result or how fancied a particular horse is. There is also the reality that predicting what the weather is going to do in this part of the world is always a thankless task. But if, when the world is watching, every effort is made to make sure the Aintree National is run on ground on the easy side of good, and if yielding is the ideal scenario striven for at the Punchestown festival, then the prospect of steeplechasers being asked to run four miles with 'firm' in the description really does jar. Statistically it is the case over jumps that the faster the ground the greater the injury rate. Such statistics don't take into account the quality of horse, or indeed the physical readiness of horses. These are important factors. But they don't mitigate the view that if fast ground is unacceptable at the National Hunt game's top fixtures then it should be the aim everywhere. Several experienced jockeys riding at Ayr reportedly declared the ground to be good to firm from the get-go on Saturday. 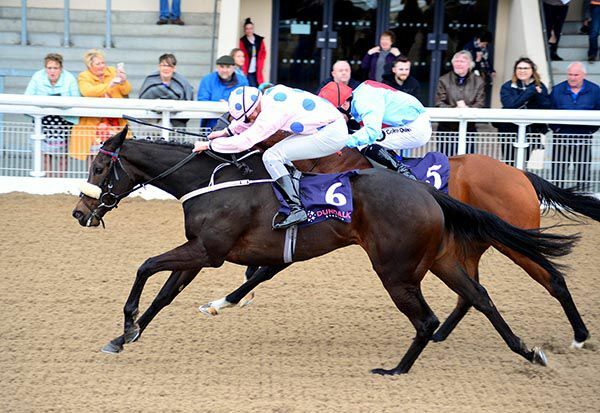 Having a prestigious programme diluted to such an extent was regrettable and brought to mind February's Dublin Racing Festival when 22 runners were taken out of the second-day action due to ground conditions that were good to firm in places on the steeplechase course. On that occasion the Leopardstown team were stuck between a rock and a hard place in terms of weather forecasts and demands for watering. In many ways they were damned if they did and damned if they didn't. It's always a delicate balancing act when it comes to watering. But for high-profile National Hunt races erring on the side of a softer surface is surely the wisest course. In comparison perfect ground conditions on the flat are generally accepted to be good to firm on turf. On the all-weather there shouldn't be an issue at all. But when just 64 runners are declared at a fixture, and trainers under pressure to find races opt not to send horses at all, then it's clear the surface at Dundalk is unacceptable to many professionals, including on a welfare basis. There appears to be rare consensus among all sectors that Dundalk's Polytrack needs to be ripped up and resurfacing take place as soon as possible, a task that apparently take three months in terms of sourcing material, another three months for installation, and all of it at a cost estimated at around €2.5 million. There's far from consensus though at how it has been allowed get to this stage. After 12 years of use many trainers and jockeys now argue Ireland's sole all-weather surface is basically sand on top of a hard foundation, a state of affairs leaving too many horses that run on it stiff and sore. Irish Horseracing Regulatory Board statistics indicate the fatality rate at Dundalk hasn't altered significantly in recent years. The IHRB's licensing committee says there is no issue with Dundalk at the moment either. But those rates don't take into account sore horses and it is the lack of runners that is the real verdict on what is a worrying change, especially in the current welfare climate. Of course it's easy to be 'flaithulach' with someone else's money. But if artificial surfaces are generally regarded as having a lifespan of no more than a decade then it begs the question as to why it has been allowed get to this extent. That's obviously a question for Dundalk, but also for Horse Racing Ireland. The next step is for Dundalk to come back to HRI with a detailed plan about resurfacing ahead of an April 29 board meeting. Dundalk has three more fixtures on its Spring calendar before a break until September. With reluctance to use the all-weather there are consequently increasing demands from trainers for more turf opportunities for their horses. Providing such opportunities appears a less straightforward task than might be imagined although industry suspicions that it is something to do with the Racing TV media rights deal is disputed by HRI. However Brian Kavanagh's assertion that the first purpose of a race programme is to satisfy the needs of the horse population suggests movement on that issue may be forthcoming. There was plenty to quibble with over the last two years, particularly the decision to keep the Derby and 'Irish Champions Weekend' there during construction, a move that did little to persuade people about some unreconstructed Curragh arrogance towards the racing public still being firmly in place. The real test of the biggest capital development project in the history of Irish racing begins next month. If it isn't to be dismissed as a vanity project for an elite few it has to get enough of the rest of us through the gates. But at the risk of being charged with swallowing some Curragh Kool-Aid, the new facility is impressive enough to justify anyone going to have a look. Rather like Vegas the real question will be if you're prepared to go back. Finally, many people within racing were shocked and saddened to hear of the passing of Dr Brendan Doyle. A former chairman of the Irish Racehorse Owners Association, the 63 year old was a familiar figure on Ireland's racetracks. 'The Doc' served racing well in a number of ways, not least as part of the Anti-Doping Task Force that reported in 2016. He will be sadly missed.